Hot Bob-omb is a 4-player minigame that is found during the events of the Nintendo 64 game Mario Party and Mario Party 2 (where it is stylized as Hot BOB-OMB) as a battle minigame. 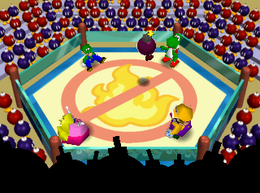 Players pass a lit Bob-omb until it explodes, as in the real-world game hot potato, off of which the minigame's name is a pun. It is played similarly to Hot Potato; however, players toss a Bob-omb. In Mario Party 2, if one of the players does not catch the Bob-omb on time, that player will slow down for a moment and the Bob-omb may explode if it is on the verge of doing so. If a player is holding the Bob-omb when it explodes, they are eliminated from the game. The Bob-omb explodes after about 30 seconds in Mario Party, and after about 15 seconds in Mario Party 2. In Mario Party, the game ends after one person loses, and that player must give 5 coins to each other player, while in Mario Party 2, the game keeps on going until there is one person left standing. The minigame can be purchased from the Mini-Game House for 300 coins when it is available for a purchase in Mario Party. Game Rules – "The Bob-omb has come. Pass it to somebody with before it explodes." Advice – The Bob-omb gets bigger and bigger as it is about to explode." Game Rules – "Don't let the Bob-omb blow up in your hands or you're out. The last one standing is the winner." Advice – "If you don't press the Button at the right moment, you'll drop the Bob-omb! If you catch it, you can pass it off right away!" 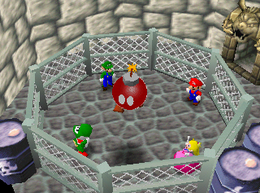 The Mario Party version of this minigame appears to be set on the same stage as Bash 'n' Cash and Grab Bag, except that a metal cage is placed all around the pit, possibly to prevent the Bob-omb from going out of bounds, or so that the players don't try escaping. This page was last edited on March 25, 2019, at 01:03.